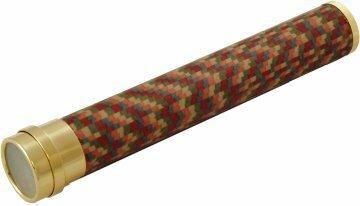 Multi coloured laminated wood cylinder with gold plated brass ends. A hand crafted kaleidoscope finished with a multi coloured patterned wooden cylinder, gold plated brass eyepiece & turnable end. Look through the eye piece as you turn the brass ornament housing at the other end & the kaleidoscope gives a wonderful view of ever changing colourful patterns. A fantastic collectible gift idea !